Ayacucho has several points of interest both inside and away from the city. In the city itself Cerro Acuchimay lookout is well worth the climb as offers a view of the whole city. Another place to sit and watch the scenery is from the terrace of the lovely Márquez de Valdelirios hotel, set in the Alameda Bolognesi. It almost goes without saying that the city's 33 churches leave those with a penchant for colonial religious architecture spoiled for choice. The artisan districts of Santa Ana and Carmen Alto are the best places to buy handcrafts, since this is where they are originally made. Fifteen miles north of the city are the Wari ruins, the remains of a 10th century city of stone built on volcanic ground, belonging to the Wari civilisation that ruled nearly all of what is present-day Peru before the rise of the Incas. A 25-mile drive from Huamanga along a well-paved road brings you to the Pampas de Quinua, the scene of the Battle of Ayacucho in 1824, that sealed the victory of the South American independence movement. A museum has been built there, displaying memorabilia of the event. The village of Quinua itself is a typical Andean community, where visitors can buy beuatifully worked pottery. 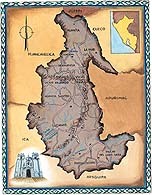 Thity-one miles from Huamanga lies the the town of Huanta. Set in a landscape of fields and orchards and the local wine is worth the trip. Those wishing to venture further afield could try the town of Cangallo a 125 miles away. Points of interest here are the Pampas de Cangallo, famous for their skilled horsemen, known as morochucos, the last remaining clear descendants of the interracial mixing that took place between the Incas and Spanish when the latter first arrived, as shown by their light-coloured eyes and thick beards. ?